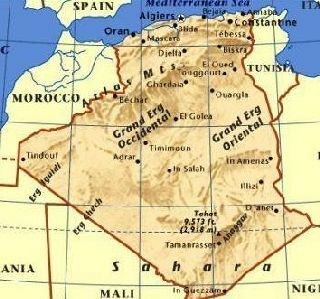 Algeria is bounded on Libya, Mali, Morocco, Mauritania, Niger and Tunisia. Highest point in the landscape is the mountain Tahat (2980 meters) in the Hoggar mountains. The Sahara extends at a distance of 5000 km. It reaches from the Atlantic Ocean to the Red Sea. The surface of the Sahara is 8 million square kilometres. It's the largest desert of the world consisting of about ten countries. The scenery of the desert is extraordinary varied. In fact you could consider this area as an open air museum with a cultural heritage of many prehistoric rock paintings. The Tuareg live in the surroundings of the Hoggar mountains, the National park, the Tassili Plateau and Unesco area. In the Tuareg culture men wear a veil and women don’t. Their spoken language is called "tamahaq" their written language is called "tifinagh" but they also speak French. 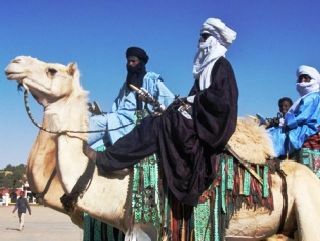 The Tuareg also live in Niger, Mali, Mauretanie, and Libie. They know the most beautiful places in the desert and that’s why they make the travel route. 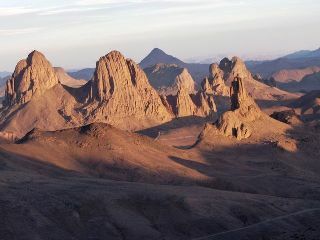 In the desert it can be very hot but in Tamanrasset, in the south, it is generally cooler. This town is situated near the Ahaggar mountains at 1378 meters of height, and in July the temperature is about 34 degrees. Look here for todays temperature in Tamanrasset and in Djanet. Sahara-Art-Venture works closely together with Tuareg, they know how to live in the desert and they are experienced tour-guides for small travelling groups. In the southern Tuareg area there has been French tourism for quite a long time.